My first project with the beautiful "Love Letters" kit from Swirlydoos Kit Club is made with one of the P. S. I Love You papers from Kaisercraft, an inexpensive frame that I've had for a long time, and paper clay! While I had my IOD Moulds out for some fun with Ice Resin (you HAVE to check out some of Kim's videos on You Tube - they give you the complete low-down on this amazing stuff here and here), I decided to create some more embellishments with paper clay. I like the results - when completely dry, they are light weight with a surface that is perfect for adhering any ink or paint that you can wish to use. I glued my pieces to a 5" x 7" wood frame, using matte gel medium and let it set for a few hours. (Gel medium actually dries in a matter of minutes, but I wanted to ensure that they were securely bonded. The entire surface was covered with a coat of black gesso, making sure that all of the cracks and undersides were coated. Again, this takes only a few minutes to dry, but I let it sit for a few hours before using a fan brush to lightly coat the entire frame with silver metallic paint, leaving a lot of small spaces black to give it all a look of depth. 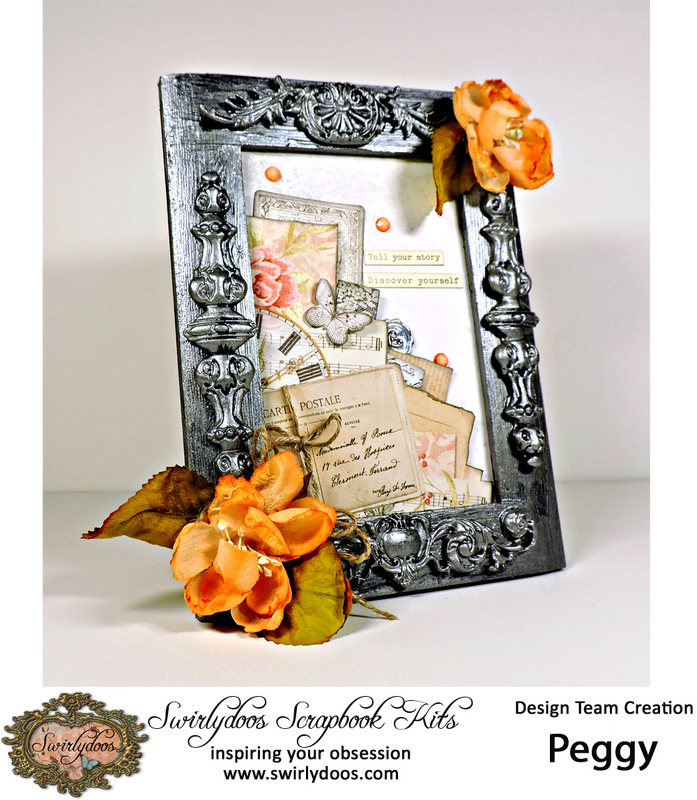 Next, I took the Ornate Frames from Kaisercraft's P.S. I Love You collection, carefully cut out the center with my craft knife and put the outside frame aside for another project. I fussy cut the design from the paper and cut part of the remainder to fit the backing. The image was a bit too large to fit, so I trimmed it a bit and tucked the excess parts, along with a bit of Prima's Salvage District ephemera from an earlier kit, in back. As embellishments, I used a butterfly that I also cut from the paper, a few lines of tiny text, a bit of Prima bling, also from my stash and a silver heart sticker from this month's kit. I dug into my bin of flowers and came up with these beautiful Petaloo Botanica blooms and leaves that blend perfectly with the pretty colors of the paper. To finish it all off, I added a double twine bow.